The Coryton Oil Refinery Protest suffered a low turn out today with numbers being blamed on Police intervention and lack of public awareness. Groups from around the UK had confirmed their attendance and reports of please stopping convoys have been rife. Those that did turn out where issues threats of traffic offences as they attempted a go-slow. Police have been quick to respond to the recent protests, even threatening use of traffic laws dating back to 1839 that can be used against protesters if they cause blockages to roads. Even with the low turn out the organisers stand tall and have confirmed another protest has been organised for the 5th Feb.
We urge that you fully support this protest and please share with as many people as possible using the buttons below. Even if you cant attend, please help spread the word. For more information on the protest see their facebook page. We’ll issue further information as we get it. 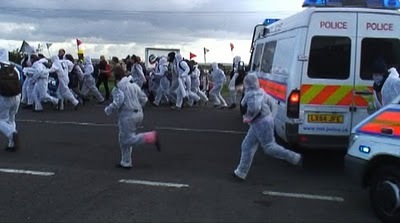 ‹ Stanlow Fuel protest today! Show your support! 1 Pings/Trackbacks for "Coryton Oil Refinery Protest suffers low turn out, but another confirmed"